BROOKINGS, S.D. – For the first time in 714 days, an opposing team came to Frost Arena and walked away with a win. Montana led for the final 23 minutes on Saturday, stealing an 85-74 road victory to close non-conference play. South Dakota State’s 28-game home winning streak was the nation’s longest active streak entering the night, last losing on its home court on Jan. 7, 2017. The Jackrabbits own the nation’s best home record over the past eight seasons, and hadn’t lost a non-conference home game since Nov. 14, 2013 – to Montana. Montana was impressive on both sides of the ball, scoring 14 points above SDSU opponents’ season average. On defense, Montana held the 13th-best scoring offense 11 points below its season average. 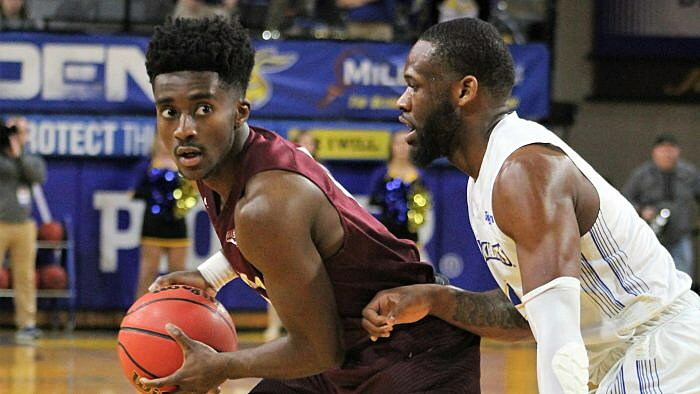 The Jackrabbits entered the night ranked in the top seven nationally for shooting, three-point shooting and free-throw shooting, but were held below their season averages in all three categories. As he is known to do, senior Michael Oguine was at his best when the lights were shining bright. He scored 23 points while collecting a team-high nine rebounds. During a 15-6 run in the first half, Oguine had 10 of Montana’s points, including seven in a row. SDSU fought back to take a four-point lead before the Grizzlies closed the half on a 15-5 run. The Grizzlies led for the entire second half, including by eight or more for the majority of the period. The closest SDSU got was four points with under 6 minutes to play. The Grizzlies responded with scores on their next three possessions to push the lead back to double digits. With the win, Montana closed non-conference play with a 7-4 mark, its best winning percentage since 2010-11. The lead changed eight times through the first 17 minutes, before Montana led for the final 23 minutes (31:26 overall). After being out-rebounded in six consecutive games against Division-I opponents, Montana out-rebounded SDSU, 37-34. The Jackrabbits ranked 35th in the NCAA for rebounding margin (+6.7) and had been out-rebounded just three times this season. Opponents entered the game shooting just .292 from deep against SDSU, but Montana made 11 three-pointers on .393 efficiency. The 11 treys were UM second-most this season. The Grizzlies had four players score in double figures. In addition to Oguine’s 23, Ahmaad Rorie had 16, in addition to six assists and two steals, while Sayeed Pridgett had 14, and Kendal Manuel scored 11 on three three-pointers. SDSU closed to within four points with 6 minutes to play before Manuel scored on back-to-back possessions, including a trey. Senior Bobby Moorehead hit two big three-pointers, including one in the closing seconds of the first half that gave the Griz a six-point halftime lead. After missing Wednesday’s game at Arizona (wrist), senior Jamar Akoh returned to the starting lineup. He filled the stat line with eight points, seven rebounds, four assists, two steals and two blocked shots. SDSU was held to 36 first-half points – second-fewest of the season – and trialed at the intermission for the first time at home this season. Montana’s 42 first-half points were as many as it had in Wednesday’s entire game at Arizona. Montana’s bench scored 18 points, compared to two for SDSU. Four Grizzlies had four or more fouls, including Akoh, who played the final 14:34 with four fouls. SDSU has been to the NCAA tournament in three consecutive seasons and was picked to again win the Summit League title in 2018-19.